On the eve of his 40th birthday, Gary Marcus, a renowned scientist with no discernible musical talent, learns to play the guitar and investigates how anyone of any age can become musical. Do you have to be born musical to become musical? Do you have to start at the age of six? Using the tools of his day job as a cognitive psychologist, Gary Marcus becomes his own guinea pig as he takes up the guitar. In a powerful and incisive look at how both children and adults become musical, Guitar Zero traces Marcus's journey, what he learned, and how anyone else can learn, too. A groundbreaking peek into the origins of music in the human brain, this musical journey is also an empowering tale of the mind's enduring plasticity. Marcus investigates the most effective ways to train body and brain to learn to play an instrument, in a quest that takes him from Suzuki classes to guitar gods. From deliberate and efficient practicing techniques to finding the right music teacher, Marcus translates his own experience as well as reflections from world-renowned musicians into practical advice for anyone hoping to become musical, or to learn a new skill. Guitar Zero debunks the popular theory of an innate musical instinct while simultaneously challenging the idea that talent is only a myth. While standing the science of music on its head, Marcus brings new insight into humankind's most basic question: what counts as a life well lived? Does one have to become the next Jimi Hendrix to make a passionate pursuit worthwhile, or can the journey itself bring the brain lasting satisfaction? 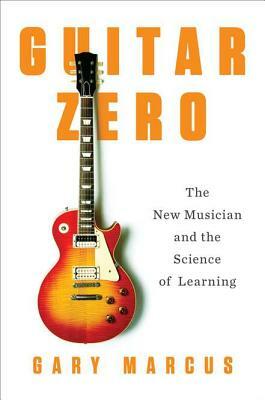 For all those who have ever set out to play an instrument or wish that they could Guitar Zero is an inspiring and fascinating look at the pursuit of music, the mechanics of the mind, and the surprising rewards that come from following one's dreams. Gary Marcus studies evolution, language, and cognitive development at New York University, where he is a professor of psychology and the director of the NYU Center for Child Language. The editor of the "Norton Psychology Reader" and author of three books about the origins and development of mind and brain, Marcus has written articles for "The New York Times, Wired, Discover," and "The Wall Street Journal," and has appeared on radio and television programs around the globe.